This Vertical Storage Folding Chair Dolly by Flash Furniture is the best choice in chair storage when space is an issue. The heavy duty all steel construction will withstand the test of time and provide years of use throughout all of your events. The four casters makes storing and transporting your folding chairs a safe and fast task. 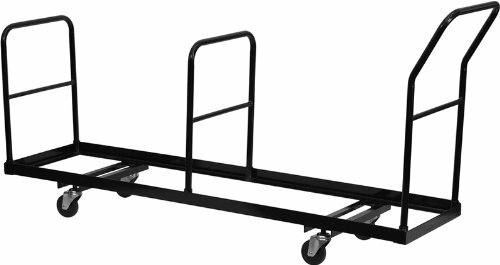 [NG-DOLLY-309-35-GG].Metal Folding Chair Dolly. Stores Up to 35 Folding Chairs in an Upright Position. Three Tubular Handles. Constructed of .125'' Thick L-Shaped Steel. Solid Steel Components. Dual Support Braces Provide Added Durability. Four 4'' Polyolefin Swivel Casters. Please Note: This dolly is designed for metal folding chairs only. .
Color: Black. Made in China. Overall Dimension: 19.25''W x 80.75''D x 39.25''H.Shipping Weight: 64 Lbs.